The Gospel Recording Co. label was located in New York City and in operation from the late 1950’s to the early 1970’s. Little is known about the label’s history and the people involved; most information was drawn from 45’s, LP’s and eBay ads. Although listed under the name Gospel Recording Co., the label had in fact three different names: Gospel Recording (200, 300, 400 series, #1369, 1370, 1497, 2171 and some early issues in the 200 and 1300 LP series, but on the labels only – the covers show the Gospel Recording Co. name), Gospel Recording Co. (most of the 500 series and the 600, 700 and 800 series, the majority of the LP issues) and GRC (#507, 513, 518 and 524, maybe a few more). Apart from the above, some LP covers show the name as Gospel, Gospel Records or Gospel Recordings. However, the labels for these issues still show Gospel Recording Co. The listing below shows all LP’s with the name Gospel Recording Co. The 45’s/78’s are listed the way the labels indicate. LP’s #1364 (Prof. Herman Stevens) and 217 (Gospel All Stars) were reissued with different covers. Maybe there were more LP’s reissued. LP’s #1376 (Dewey Young) and 1377 (Brooklyn All Stars) are mentioned on the back covers of other Gospel Recording Co. LP’s, but it’s unknown if they really exist. LP 1385 (Rev. Howard Coleman) seems to have been released in a blank, gold-colored cover. The Southland Singers (#505) and the Southland Mission Singers (#531) are supposed to be different groups. Gospel Recording Co. 506 seems to have been released twice, by the J.C. Downing Quartette and by the Peerless Four Quartet. Jimmey Jones (#538) is Jimmy Jones, also known as “Mr. Bass”, who recorded with the Northern Aires (Northernairs) on JAS and with the Sensationals on Savoy. All years given are estimates, all missing numbers are yet unknown releases (some may not have been released). 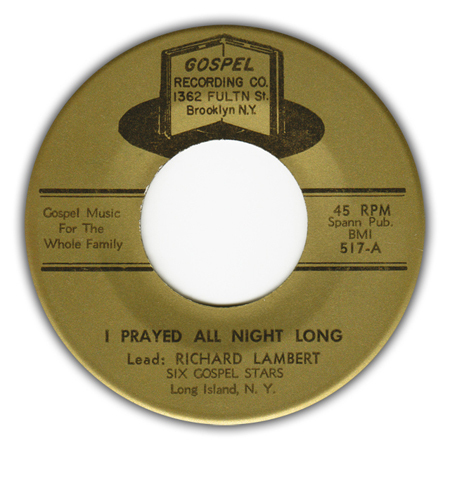 This page lists all known releases (78’s, 45’s, EP’s and LP’s) on the Gospel Recording Co. label.